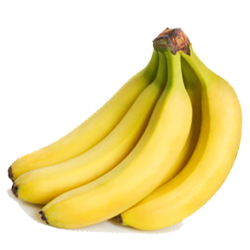 Bananas is an edible fruit with a thick yellow peel with a creamy, semi-starchy sweet flesh. Bananas are known for their potassium rich flesh and other nutrients including vitamin B, C, fibre, and magnesium. They are one of the more calorie dense fruits, making them an extremely efficient and sustainable small meal. Bananas are available worldwide and at all times of the year. They are also the 4th most popular agricultural product in the world. Bananas are best enjoyed when firm, bright in colour, and free from bruises. This fruit should be left to ripen at room temperature. If you need to speed up the ripening process, you can place bananas in a paper bag with an apple or tomato overnight. Bananas are a great ingredient in smoothies, salads, yogurts, cereal, cakes, muffins, breads, ice-cream, pudding and so much more.